Successful applicants to the Vantage One programs will be notified by email with their official offer letter. In the meantime, you can download the official Vantage One Registration and Orientation guide for 2019. You can also see the status of your application via UBC's online Student Service Centre. Once you have received an offer to join UBC Vantage College, here are are the next steps to prepare you for your program. When you receive an offer of acceptance, it means we have reserved a place for you at UBC Vantage College, but we can only hold it for so long. To reserve your spot, you must formally accept your offer and pay your non-refundable $3000 CAD deposit before the date listed on your UBC Offer of Admission letter. Please note that the Vantage One does not permit program changes after you have accepted your offer of admission. 2. Log in and select "Accept My Offer"
Your deposit will be applied to your first-term tuition instalment. 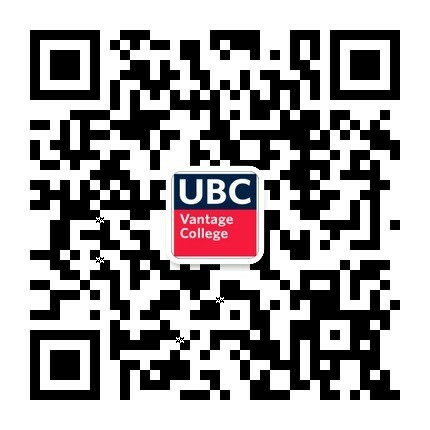 If you do not plan to attend UBC Vantage College, please visit the Student Service Centre and select "Decline My Offer." UBC Vantage students have the option to live on campus, which we highly recommend in your first year of study. We have reserved campus accommodation for all incoming Vantage students, but you must apply for student residence by May 1, 2019 in order to maintain your housing guarantee. When you apply for housing via the Student Service Centre (SSC), make sure you complete the 'Preferences' section. You will either be assigned residence in Totem Park, Place Vanier or Orchard Commons. Depending on which residence you are assigned, fees will vary. You’ll also have a range of meal plan options to choose from. Applying for housing automatically enrols you in UBC's Jump Start orientation, too. Once your housing offer is sent, you must formally accept the offer via the SSC portal in order to confirm your placement. For more information on accommodation, visit our Student Housing page. As an international student, you will need a valid post-secondary study permit to attend UBC Vantage College. Obtaining a permit might take several months, so we encourage you to submit your application as soon as you accept your offer. Read up on our study permits page to learn more about the application process. Log into UBC's Student Service Centre and register for a Vantage Standard Timetable (STT). All incoming Vantage students will receive an email with instructions on how to complete the registration process. This email will also include your registration start time and date. Once registration opens, you should register for courses as soon as possible as STT's have limited capacity. Registration for first-year students opens in mid to late June.